PaceMaker Insulated Nailbase is a nail-base panel of Exposure 1 rated oriented strand board (OSB) and UL Classified EPS rigid insulation. It is an ideal insulation and nailable surface for roofing and walls. Stability and traffic resistance make PaceMaker Insulated Nailbase perfect for both residential and commercial structures. PaceMaker Insulated Nailbase provides both insulation and nailable substrate for roofing or wall cladding materials. It can quickly be installed over a structural roof or wall decking with nail or screw connection. Standard roofing materials such as shingles, shakes, standing seam metal, tile, slate, etc., have been applied to PaceMaker Insulated Nailbase. Wood, vinyl, metal, stucco, etc., are all installable wall claddings over PaceMaker Insulated Nailbase. PaceMaker Insulated Nailbase is made under factory Quality Control conditions. Only superior grade, exterior exposure rated OSB skins are used. Core material consists of EPS made under strict third party laboratory monitoring. 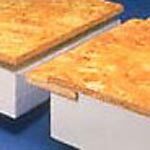 PaceMaker Insulated Nailbase's EPS contains no CFC'S, HCFC'S, HFC'S, or formaldehyde. It is inert, non-nutritive, and highly stable, and therefore will not decompose, decay, or produce undesirable gases or leachates. EPS can be recycled and is safe for WTE Systems and landfills. We encourage you to support recycling and energy conservation. Installation shall be in strict accordance with manufacturer's published instructions, details, and drawings that are part of the contract documents for this project. PaceMaker Insulated Nailbase Panel can be installed over a solid wood deck or any suitable structurally sound substrate. If a design requires a vapor retarder, it should be applied to the existing substrate prior to the installation of the PaceMaker Insulated Nailbase Panel. In retrofit applications, where an effective vapor retarder is already in place, this requirement may be met. PaceMaker Insulated Nailbase should be mechanically fastened with screws long enough to penetrate decking and/or structural members a minimum of 1" and provide adequate holding power. Fastener spacing should be designed on an individual project basis. Approximately 1/8" spacing between panels should be provided to allow for expansion. Wood blocking should be provided at all perimeters and openings. When required, connection splines are provided by manufacturer. Roofing and/or cladding materials to be installed per manufacturer's specifications and recommendations.